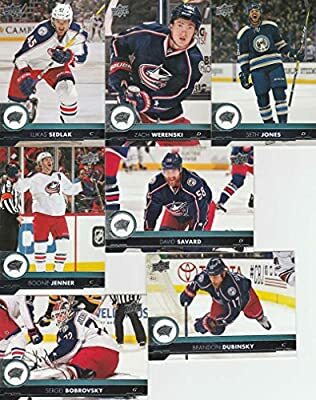 2017-18 Upper Deck Hockey Series 1 Columbus Blue Jackets Team Set of 7 Cards which includes: Brandon Dubinsky(#51), David Savard(#52), Lukas Sedlak(#53), Sergei Bobrovsky(#54), Seth Jones(#55), Zach Werenski(#56), Boone Jenner(#57) Card Conditions are NM-MT. Team set ships in a protective Plastic Snap Case. We have team sets for Baseball, Football, Basketball, Hockey, and Soccer. We have a large selection of Autographs, Jerseys, and Memorabilia cards! 2017-18 Upper Deck Hockey Series 1 Columbus Blue Jackets Team Set of 7 Cards which includes: Brandon Du Card Conditions are NM-MT. Team set ships in a protective Plastic Snap Case. We have team sets for Baseball, Football, Basketball, Hockey, and Soccer. We have a large selection of Autographs, Jerseys, and Memorabilia cards!